Rapper Slick Rock was born BeJorn Johnson on July 20, 1992. His mother named him after the World’s #1 French Tennis Player, Bjorn Borg. An Atlanta, Ga native raised in the city of Decatur where some of today’s hottest artists were bred, Keri Hilson, Ludacris and more; Bejorn was born to be a star. Slick Rock adopted his rap name from having a slick tongue for rap lyrics and being a rock in his neighborhood. Rock stands hard against all odds and he never backs down from anything. Slick Rock, the 22 yr. old with exquisite looks is bringing something neoteric to the rap game. His sound is strong vocally, hard hitting tracks with slick lyrics to seal it all. Inspired by his older brother who made rap look easy, he guided Slick Rock into rapping and perfecting his skills. Although his skills were amateur and unpolished, he never gave up. Listening and studying some of his favorite rappers T.I., Rocko, and Young Dro brought him up to the level of skill he’s at today, superb. Recently, Slick Rock has been in the studio recording a mix tape while working a 9-5 job to pay for his music project. During this time he was discovered by now mentor and music producer Haitian Monk. 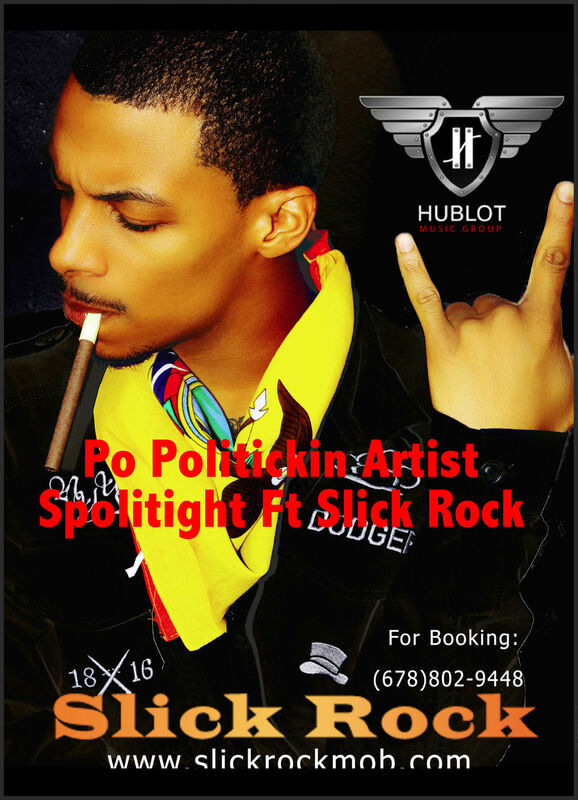 His drive and dedication caught the eye of the CEO of Hublot Music Group in Atlanta, Ga. Haitian Monk has signed Slick Rock to Hublot Music Group’s Independent Record Label and is the first artist to be released. The dynamic duo has been brewing hits in the studio for 8 months and is about to drop an EP/Album/Mix tape for release in early 2014. Slick Rock is a hot new hip hop artist who’s mass appeal is bringing back raw commanding rap vocals, and infectious hooks all penned by himself. Expect the unexpected from this future “Icon”, SLICK ROCK as he gives his “Blood, Tears, and Gold” for his family, community, and fans. As of 2014, Slick Rock’s forthcoming mix tape titled: “Americano Pablo” has been brewing and grilling in the studio. Rock’s best sound yet to be fully released early 2015. The promo cd has been released in the streets of Atlanta with the first single “Hard 2 Choose” already burning up the online hip hop radio stations. He recently won K-100’s “ill or kill” this week and is now in rotation. Slick Rock has been performing throughout Atlanta at some of the hottest clubs like Club Vinyl, GME Lounge, and his upcoming performance will be at Suede Lounge Atl; his infectious performances have been gaining him more fans and love on the club scene.